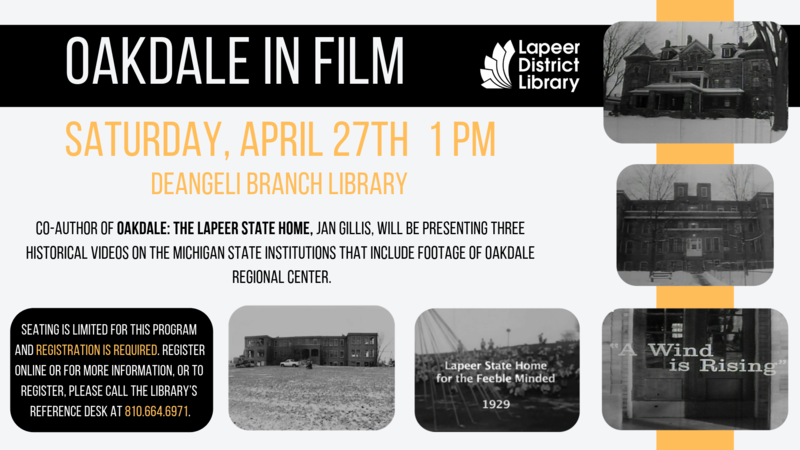 The Lapeer District Library’s Marguerite deAngeli Branch will present three historical videos on the Michigan State Institutions, including Oakdale Regional Center, and the history of care for those with developmental disabilities, hosted by the co-author of Oakdale: The Lapeer State Home, Jan Gillis. These film clips will show the campus and the institution’s day-to-day life as well as the deinstitutionalization of the residents. This event takes place on Saturday, April 27, 2019, at 1:00 p.m. There is limited seating for this program and registration is required. Register online or call the library’s (810) 664-6971 for more information about the program. The book, Oakdale: The Lapeer State Home, published by Arcadia Press will also be available for purchase and signing.